I have successfully completed hardware part. Now I can concentrate on the software part where i need to construct the circuit for display. The cycle ergometer will display on LCD the information about revolution per minute (RPM), distance,speed and time . Anything device that have LCD will use the microcontroller. For this week, i was concentarte to Sensor.After some research, i found that magnet and reed switch will be attach to the bicycle and use as a sensor. What i have to find out is the suitable microcontroller that i can use to built a programmed for RPM, distance,speed and time to be display on LCD. What is a reed switch ? 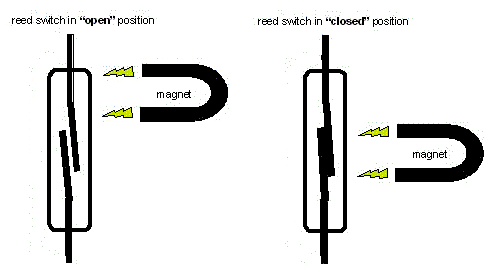 The basic reed switch consists of two identical flattened ferromagnetic reeds, sealed in a dry inert-gas atmosphere within a glass capsule, thereby protecting the contact from contamination. The reeds are sealed in the capsule in cantilever form so that their free ends overlap and are separated by a small air gap. A reed sensor is a device built using a reed switch with additional functionality like ability to withstand higher shock, easier mounting, additional intelligent circuitry, etc. How does a reed switch work ? 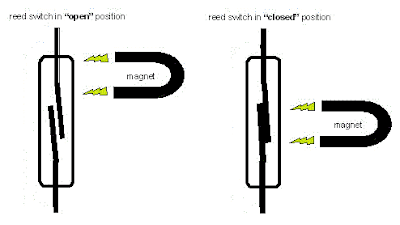 When a magnetic force is generated parallel to the reed switch, the reeds become flux carriers in the magnetic circuit. The overlapping ends of the reeds become opposite magnetic poles, which attract each other. If the magnetic force between the poles is strong enough to overcome the restoring force of the reeds, the reeds will be drawn together. What are the advantages in using reed switches ? - Hermetically sealed in glass environment. - Safe to use in harsh industrial and explosive environments. - Immune to electrostatic discharge (ESD) . - Do not require any external ESD protection circuits. - The isolation resistance between the contacts is as high as 1015ohms. - Contact resistance is as low as 50 milli-ohms. - Directly switch loads as low as a few micro-watts without needing external amplification circuits, to as high as 120W. - When used in combination with magnets and coils, they can be used to form many different types of relays.